Jubbergate first appears around 1200 as Bretgate and by 1280 was called ‘Joubrettegat – ‘the street of the British in the Jewish quarter’. The part of the street north east of its junction with Peter Lane was known as High Jubbergate, and that to the south west as Low Jubbergate. 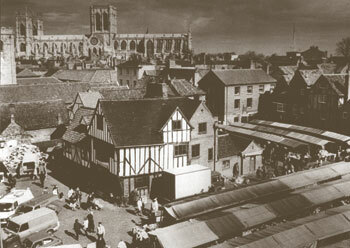 The building is now free-standing in the market place, though the position was originally, before the destruction of the adjoining properties, at the end of Jubbergate at the junction with Newgate and Little Shambles. It is a two-storey, gabled and timber-framed medieval building with attics, much restored and with a modern extension at the rear. 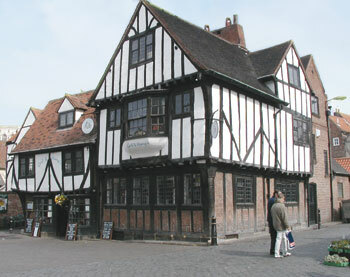 Photographs taken at the turn of the 19th and 20th centuries show that the timbering was plastered over, and the approach to it was cobbled. One photograph shows a bracket gas lamp fixed to the north west corner, and a board over the window bearing the words “A Wells, Broker”. The house, then numbered nine, had properties adjoining on the east, and it is said that at one time it housed six families. It was restored for use as a restaurant in about 1929 and is still used for that purpose. 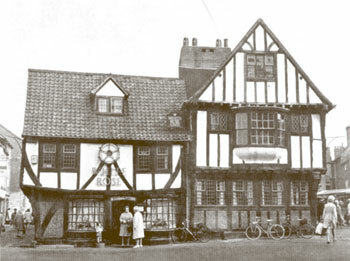 The Trust purchased the property in 1957.